Schools could close and accidents may create NJ highway delays as the winter storm alerts have expanded again in NJ. Find out where. 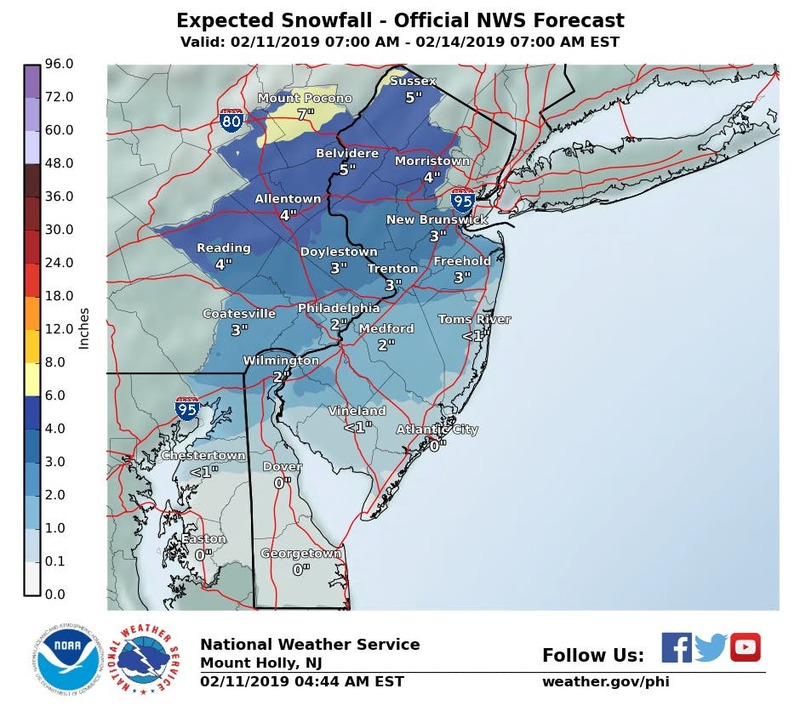 A winter storm warning has been issued for six counties for a system that could bring snow and ice and cause power outages and messy roads on Monday evening and Tuesday evening (see snow estimates below). 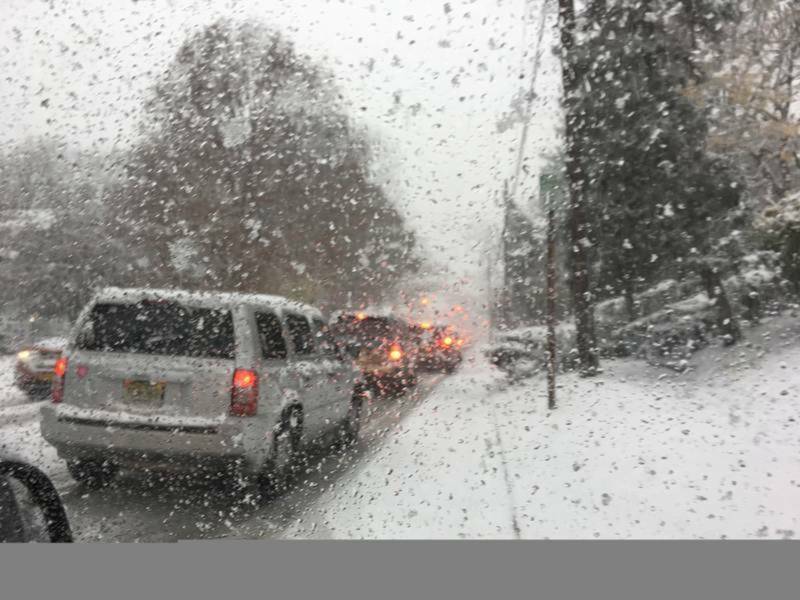 A winter storm warning was issued for Sussex, Passaic, Morris, Somerset, Hunterdon and Warren conties while a winter weather advisory was declared for the rest of the state, except for Cape May County. The National Weather Service is now predicting that the Monday-through-Tuesday weather could be worse than originally expected. Some towns got as many 3 inches of snow already. Patch has been updating the snow totals as they come in. Some snow could start falling after 10 p.m., but the bulk of the new precipitation is expected to arrive after midnight. Mixed precipitation expected. Total snow accumulations of 2 to 4 inches – mainly during the overnight hours – and ice accumulations of a light glaze are expected through most of the state, mainly Tuesday morning. The Sussex County area could get 5 to 7 unches, while South Jersey will likely get 1 to 3 inches. Plan on slippery road conditions. The hazardous conditions could impact the Tuesday morning and Tuesday evening commutes. 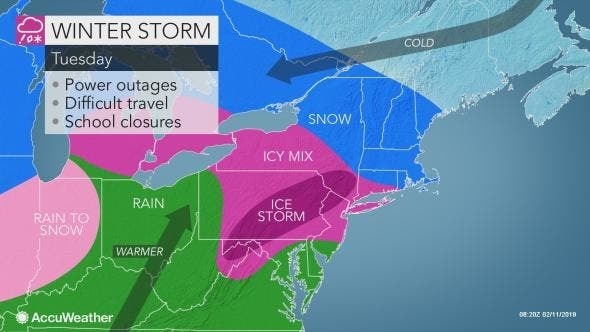 The storm will start as freezing rain across a swath of the Ohio Valley and snow in the mid-Atlantic around Philadelphia and State College, Pennsylvania, accordng to AccuWeather. 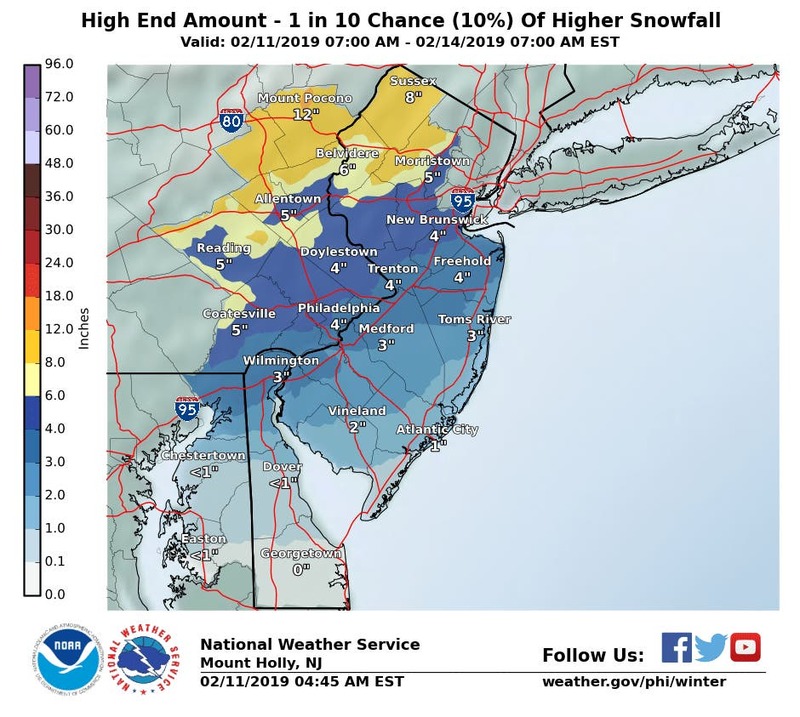 On Monday night, snow will overspread much of New York, Pennsylvania and New Jersey while icy conditions plague a swath stretching from central Michigan to the Delmarva, including Detroit, Harrisburg, Baltimore and Philadelphia, according to AccuWeather. During this time, travel will become increasingly difficult and dangerous as roads become coated in slick snow and ice. Widespread instances of spin-outs and accidents can occur, as well as mounting airline delays, according to AccuWeather. Snow will continue over much of New York and New England on Tuesday while freezing rain and sleet fall across southern New York, eastern Pennsylvania and New Jersey. Any snow that hasn’t been cleared away will become heavier and harder to remove with the added ice, according to AccuWeather. Monday night: Snow or rain. Low around 29. East wind 5 to 9 mph. Chance of precipitation is 80%. New snow accumulation of around an inch possible. Tuesday: Snow, freezing rain, and sleet before 1pm, then rain. High near 41. East wind 14 to 17 mph. Chance of precipitation is 100%. Little or no ice accumulation expected. New snow and sleet accumulation of 1 to 3 inches possible. Tuesday night: Rain, mainly before 5am. Low around 35. East wind 6 to 16 mph becoming west after midnight. Chance of precipitation is 90%. New precipitation amounts between a half and three quarters of an inch possible. Wednesday: A chance of rain before 7am, then a slight chance of showers between 7am and 1pm. Partly sunny, with a high near 43. Breezy, with a west wind 14 to 21 mph, with gusts as high as 39 mph. Chance of precipitation is 30%. New precipitation amounts of less than a tenth of an inch possible.